Different cannabinoids are created when the flower is exposed to UV light, aging, oxidation and heat. Each cannabinoid has unique medicinal effects. Cannabis is unique in that it is the only plant able to produce cannabigerolicacid (CBGa). The first cannabinoid the cannabis plant produces in raw form is CBGa. Cannabis synthesizes through natural enzymes to change CBGa into three main cannabinoid branches. 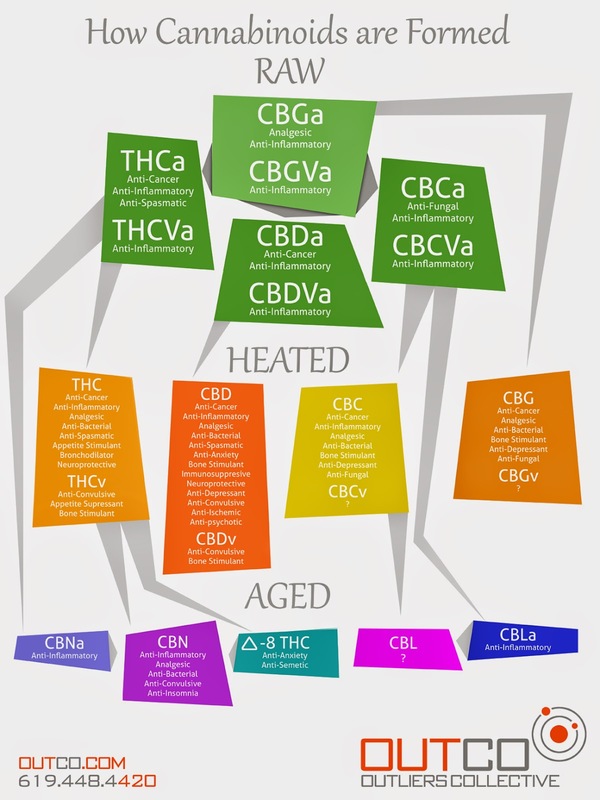 CBGa is in an unstable form and typically is converted to other cannabinoids quickly. These three cannabinoids types are tetrahydrocannabinolic acid (THCa), Cannabidiolic acid (CBDa) and Cannabichromenic acid (CBCa). Heat changes cannabinoids into THC, CBD, CBG and CBN. This conversion process is created by losing a carbon dioxide molecule (CO2). In this state they are thought to be in a neutral form. When a strain has a high CBGa content smoking it will add heat and change it to CBG. Raw or heated cannabis can turn into different cannabinoids when it has oxidation and age. THCa with oxidation will change to CBNa. Aged THC will change into CBN or Tetra8 THC. When aged CBC will turn into CBL. Raw CBCa turns into CBLa over time. Its a very useful and helpful article. Enjoyed reading the article.